PHOTO BY ZACH BAKER Columbian doubles player Jacob Beamer returns a serve before a match against Bellevue. Columbian coach Chip Weingart said he knew how important Thursday’s home match with Bellevue was. The Tornadoes came into the Sandusky Bay Conference Lake Division tilt at 2-1 in league matches. The Redmen came in 3-0. The top team in the conference, Norwalk, entered the day with a 3-0 mark. Simply put, if Columbian had designs on being in the league title mix, it couldn’t afford to lose to the Redmen. “This is a match we had to win today,” Weingart said. PHOTO BY ZACH BAKER Bellevue’s Zach Fischer competes Thursday in Tiffin. His players came through, winning every match but one in a 4-1 victory. Columbian’s lone loss came at first singles, where the Redmen’s Zach Fischer upended Collin Burkett 6-7 (5-7), 7-6 (7-5), 10-7. But Columbian had already clinched things before that match was over. “A lot of really closely contested matches, and it was good to see our guys finish,” Weingart said. 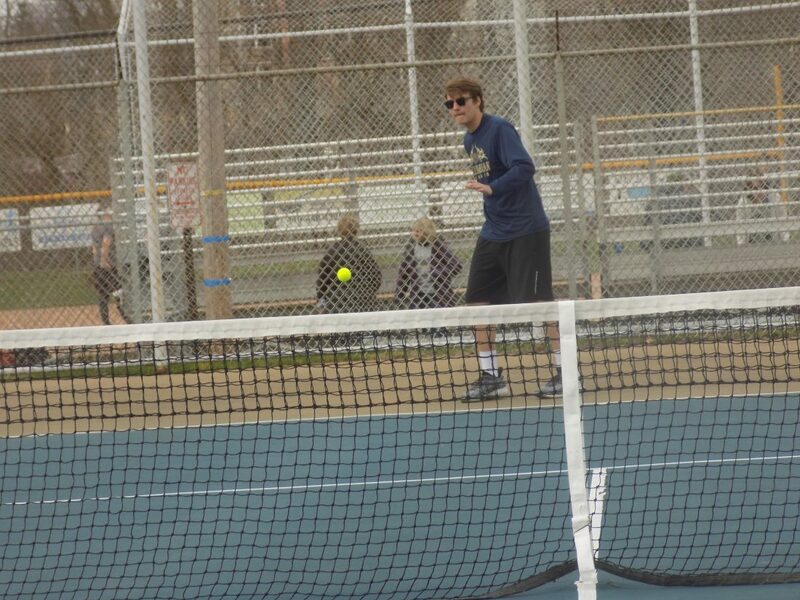 Columbian’s first win came at second singles, where Jason Weng defeated Bellevue’s Hunter Musselman 6-1, 6-1. It was a cool, breezy day at the courts near Frost-Kalnow Stadium. Maybe it wasn’t great for spectators, but Weingart said it was perfect for Weng. 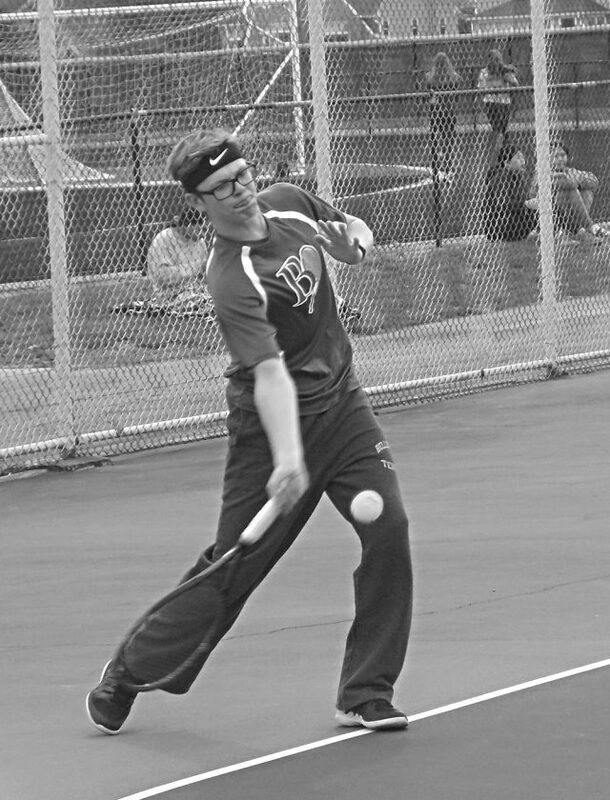 At third singles, Weingart’s son, Jacob, got through a tough match, topping Bellevue’s Andrew Dye 6-1, 7-6 (7-1). Coach Weingart said he was very pleased with his doubles teams. The duo of Zach Krintzline and Jacob Beamer upended the Redmen’s Gunner Lilly and Richard Stombaugh 6-2, 6-3 at first doubles. Columbian’s second doubles team of Ryan Crocker and Austin Hill got past Aaron Baker and Zach Eskins 7-6 (7-3), 6-2. Bellevue’s highlight came from Fischer, who outlasted Burkett to notch a victory. Bellevue slipped to 4-4, 3-1 in the SBC Lake. Bellevue’s next conference match is Monday, when it hosts another rival in Clyde. The Fliers are coached by Jeff MacFarland, Blaine’s father. The Bellevue coach said there are a number of teams in contention for the league crown. Meanwhile, Columbian will be in action Saturday at the Willard Invitational. The Tornadoes get back to league play at Clyde Tuesday. Weingart asked what he’ll be looking for in the upcoming days.